Now I now many people are facing economy crisis during this economy meltdown. Many people are being retrench. I told my regular buyers that me and masters will pay extra attention for them and in any threat to their career, we will inform them. One of this buyer is facing a tough audit from external. There is a huge threat. Master saw the threat with his 3rd eye and forewarn her. She heed our advise and take up our: "shield my job thai amulet"
The audit went very smoothly and she score excellently well. Dear Nayan, master has saved my job! Totally impressed with the results! I was very stressed before the auditor came to assess my work. 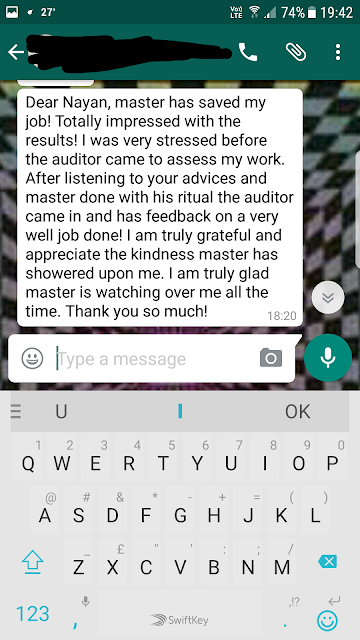 After listening to your advices and master done with his ritual the auditor came in and has feedback on a very well job done! I am truly grateful and appreciate the kindness master has showered upon me. I am truly glad master is watching over me all the time. Thank you so much!